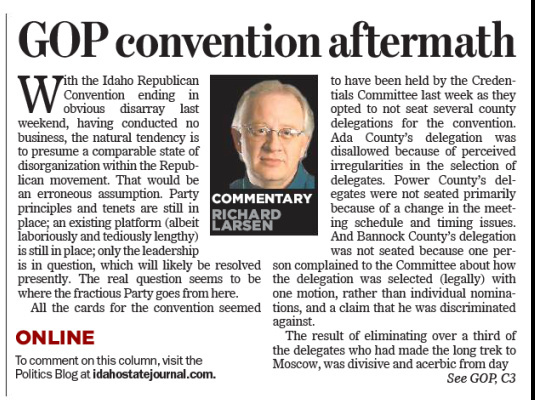 The Idaho Republican Party made national news last week when their state convention ended in contentious chaos, with a third of the delegates not seated, no platform passed, and no election on party leadership. While the story itself may be of greater interest in the Gem State, the lessons that can be learned apply nationally, as other states work through the divisiveness that is prevalent within the GOP today. With the convention ending in obvious disarray, having conducted no business, the natural tendency is to presume a comparable state of disorganization within the Republican movement. That would be an erroneous assumption. Party principles and tenets are still in place; an existing platform (albeit laboriously and tediously lengthy) is still in place; only the leadership is in question, which will likely be resolved presently. The real question seems to be where the fractious Party goes from here. All the cards for the convention seemed to have been held by the Credentials Committee, which was stacked with ideologues, last week as they opted to not seat several county delegations for the convention. Ada County’s delegation was disallowed because of perceived irregularities in the selection of delegates. Power County’s delegates were not seated primarily because of a change in the meeting schedule and timing issues. And Bannock County’s delegation was not seated because one person complained to the Committee about how the delegation was selected (legally) with one motion, rather than individual nominations, and a claim that he was discriminated against. The result of eliminating over a third of the delegates who had made the long trek to Moscow, was divisive and acerbic from day one. The proceedings, having been tainted from the start, left little hope of deescalating tensions, and getting down to business. Convention Chairman, 1st District Congressman Raul Labrador, said after the unproductive convention, “This is as low as the party can go. We have hit bottom. I think the party has no choice but to go up from here.” Whether Labrador’s comments prove true or not is up to the individuals and the various factions fighting for supremacy within the Party. If they individually and collectively continue to perceive those who agree with them 80% of the time as their “enemies,” the organization may not have yet hit bottom. But if the members and various factions realize that the alternative to comity, mutual respect, and cooperation with one another is lost elections, resulting in more of a drift to the left of the political spectrum, the bottom may well have been observed last week. Each person who is active within the Party has a part to play in how this pans out. I would hope that maturity, a sense of shared values, and a desire to do what’s right for the state and its citizens would trump the pettiness and intransigent conduct of those who insist theirs is the only way to do things. There are characteristics of both groups that have contributed to the escalation of tensions that climaxed at last week’s convention. One is the tendency of those who have been around awhile, who have, over the years, grown adept at compromising to the left to the point that the nation only slightly resembles what it was founded as. 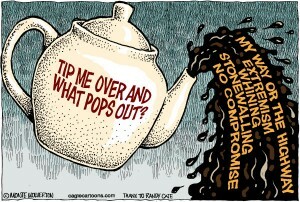 The neophytes, or newcomers, share essentially the same foundational principles, yet see compromise as a veritable sin. Consequently, they refuse to budge on anything, even slightly. They also are Machiavellian in how they interpret rules to their benefit, while ignoring those that don’t. The solution is precisely where it typically is with most matters when there are two points at apparent irreconcilable odds: somewhere in the middle. Those who have been around awhile need to realize that some compromise to the right, rather than the left, is a move in the right direction, and be willing to give some ground to hold the GOP to the principled standard that historically has been the Party’s hallmark. And the newcomers need to learn that, in order to prevent complete electoral success of the left, those who are actively transforming the republic, they need to amicably cooperate with those who have attempted to carry the conservative banner for generations, before they came along. It should never be an either/or proposition for the party faithful. It should always be an inclusive, “You and I together can make it happen,” approach. 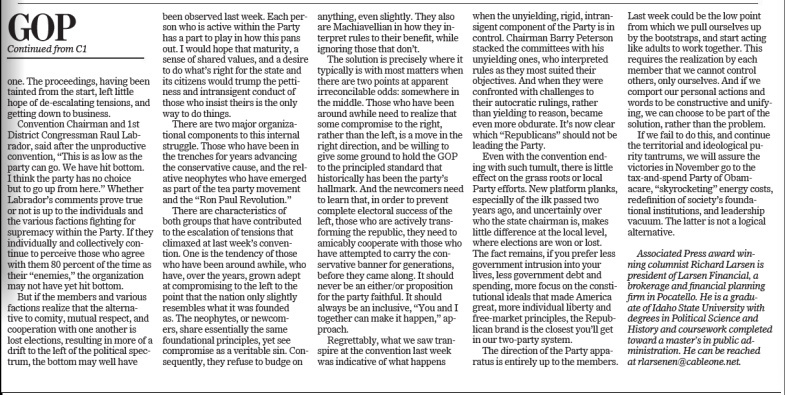 Regrettably, what we saw transpire at the convention last week was indicative of what happens when the unyielding, rigid, intransigent component of the Party is in control. Chairman Barry Peterson stacked the committees with his unyielding ones, who interpreted rules as they most suited their objectives. And when they were confronted with challenges to their autocratic rulings, rather than yielding to reason, became even more obdurate. 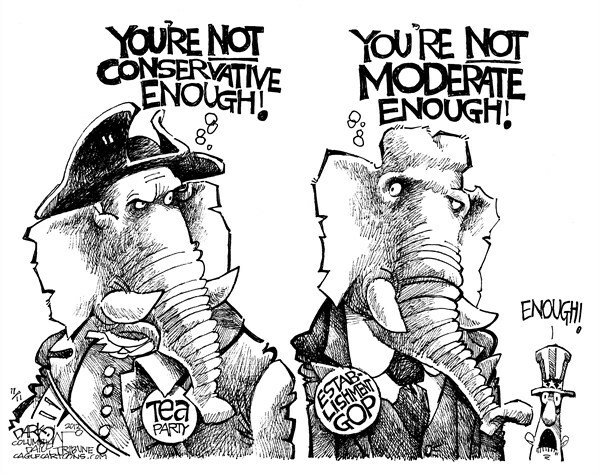 It’s now clear which “Republicans” should not be leading the Party. Even with the convention ending with such tumult, there is little effect on the grassroots or local Party efforts. New platform planks, especially of the ilk passed two years ago, and uncertainly over who the state chairman is, makes little difference at the local level, where elections are won or lost. The fact remains, if you prefer less government intrusion into your lives, less government debt and spending, more focus on the constitutional ideals that made America great, more individual liberty and free-market principles, the Republican brand is the closest you’ll get in our two-party system. The direction of the Party apparatus is entirely up to the members. Last week could be the low point from which we pull ourselves up by the bootstraps, and start acting like adults to work together. This requires the realization by each member that we cannot control others, only ourselves. And if we comport our personal actions and words to be constructive and unifying, we can choose to be part of the solution, rather than the problem. If we fail to do this, and continue the territorial and ideological purity tantrums, we will assure the victories in November go to the tax-and-spend Party of Obamacare, “skyrocketing” energy costs, redefinition of society’s foundational institutions, and leadership vacuum. The latter is not a logical alternative.